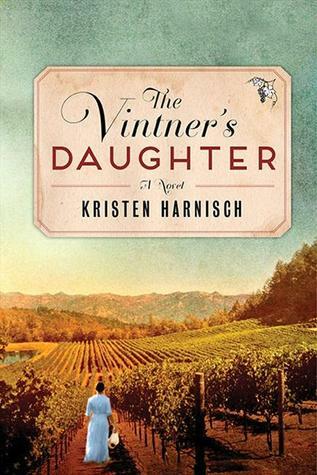 Today I'm featuring The Vintner's Daughter by Kristen Harnisch. The excerpts shared are from the Kindle version I purchased. The air was thick with the putrid smell of man and horse. Sara Thibault walked swiftly up Mott Street, taking care to life the hem or her dress and sidestep the heaps of muck without breaking her stride. Like the squabbling of chickens, the street noises swirled all around her. 56% of Ebook: "The exhilaration Sara felt as she disembarked from the steam train at the Napa depot was only mildly tempered by fear: here she was, arriving in a new city, not knowing a soul and with only fifty-four dollars to her name." My thoughts: This is a debut novel and first in a series. It came highly recommended by a friend with similar reading taste. What also sold me on this upcoming read are the settings and vineyard locale. Loire Valley, 1895. When seventeen-year-old Sara Thibault's father is killed in a mudslide, her mother sells their vineyard to a rival family, whose eldest son marries Sara's sister, Lydia. But a violent tragedy compels Sara and her sister to flee to New York, forcing Sara to put aside her dream to follow in her father's footsteps as a master winemaker. Meanwhile, Philippe Lemieux has arrived in California with the ambition of owning the largest vineyard in Napa by 1900. When he receives word of his brother's death in France, he resolves to bring the killer to justice. Sara has traveled to California in hopes of making her own way in the winemaking world. When she encounters Philippe in a Napa vineyard, they are instantly drawn to one another, but Sara knows he is the one man who could return her family's vineyard to her, or send her straight to the guillotine. A riveting, romantic tale of betrayal, retribution, love and redemption, Kristen Harnisch's debut novel immerses readers in the rich vineyard culture of both the Old and New Worlds, the burgeoning cities of turn-of-the-century America and a spirited heroine's fight to determine her destiny.